First thing Saturday morning, I got up to hit the Pilates Studio for an hour of core strength training. Plus I needed to work off the Blizzard I had the day before while we were on the road. But that Blizzard is nothing compared to what I managed to whip up later today. We managed to bring all the vegetables, lettuce, and fruits from Florida to Maryland so nothing spoiled. 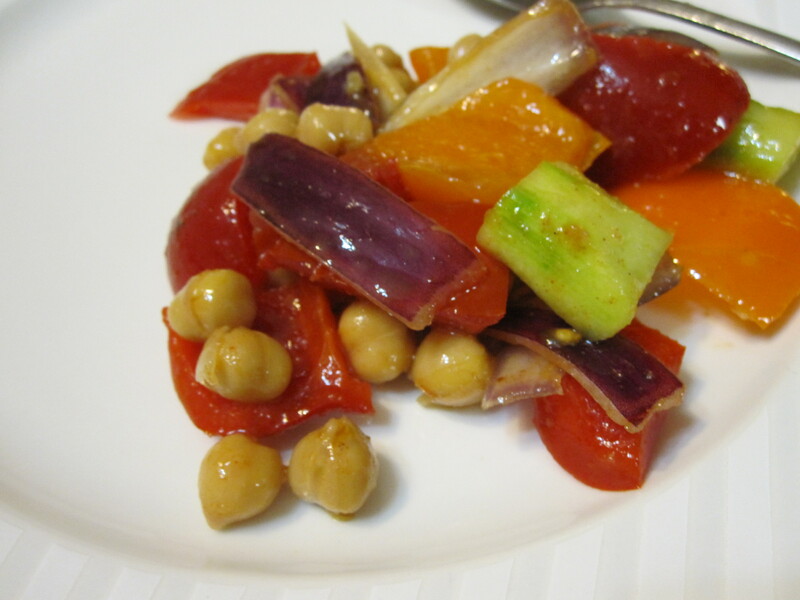 And from there, for lunch I made a great Vegetable Salad with an Oil and Vinegar Dressing. Wash, Peel and Chop up Peppers, Tomatoes, Cucumbers, and Red Onions in a bowl. Open can of Chick Peas, drain and add half of can to the bowl. Add Oil, Vinegar and Seasonings and mix. I noticed some of the food I packed to bring to Maryland, there was a bag of Pearled Barley. So I cracked open my cookbook and looked up a recipe to make with Barley. I found the Barley Vegetable Soup and decided to make it, because again we hit Maryland just in time for it to snow on our parade. But I didn’t have all the ingredients it called for, so I improvised and mixed up something better!!! Chop Onions, dice carrots, celery, parsnips or turnips, slice mushrooms. Place in pot with small amount of water or soup stock and steam for about 10 minutes. 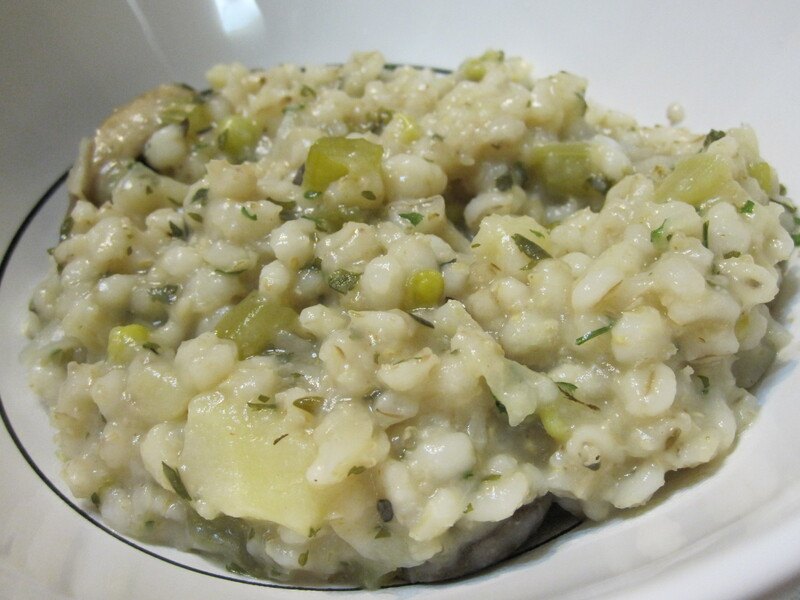 Add the remainder of the water or soup stock and bring to a boil, add barley and allow coming back to a boil. Cover and turn down to low for about 45 minutes. Add peas and mushrooms and all seasonings except parsley and continue cooking another 40 minutes. Mix in parsley just prior to serving. 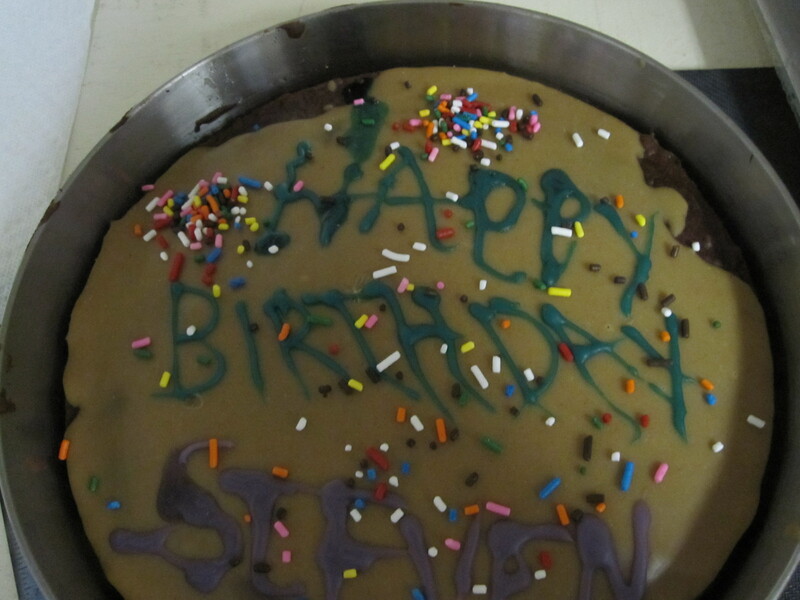 While I was making that, Mike’s son wanted to make a cake. So I found a Betty Crocker Chocolate Cake Mix box and started adding the ingredients together: 3 Eggs, 1Cup Oil, and 1/2Cup Water. I had Mike’s son mix it together while I prepared the pan and 12 Ice Cream Cones to put the Cake batter into. 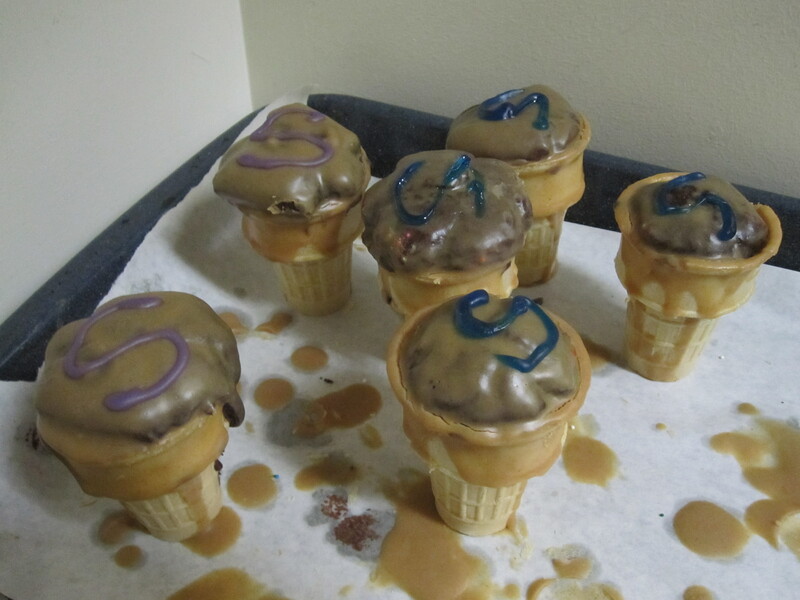 We had some fun putting the batter into the Cones (we made a bit of a mess) but then got everything into the 350 degree preheated oven to bake for 25 minutes. We didn’t have any frosting, so Mike’s son looked up on U-Tube how to make a frosting. He settled on a Peanut Butter Glaze Frosting. He added 1Cup Peanut Butter, 1Stick Butter, 1/4Cup Milk and mixed it together for the Glaze. We poured it on the Chocolate Cake, the Chocolate Cake Cones, and I did a little decorating on them, because he just had a birthday! HAPPY BIRTHDAY! So for dinner, we had the left over Vegetable Salad, Barley Vegetable Soup and I managed to polish off 2 of the Chocolate Cake Cones. I had a scheduled Mammogram appointment this Thursday morning… and did it hurt. I do have to say though; it didn’t hurt as bad as it did last year. I asked the technician giving the Mammogram, do you think I could have lost weight in my breasts and that’s why it doesn’t hurt? And she replied, it could be! It just so happens; I did lose about 5 inches in my breasts!!! Afterwards, I met up with my girl Robin at Panera Bread for lunch. I had my usual, Vegetable Soup and a Greek Salad with no Feta Cheese. This afternoon, I tried and Iced Green Tea and it was good. It tasted really sweet, so I’m wondering now just how much sugar was in that drink???? This isn’t the best thing to do… because the longer the Juiced vegetable sits in it’s juiced state the less nutritious it is. But I don’t want to get up before 5am to Juice, so I pre juiced my vegetables tonight for the road tomorrow. I’m really lovin’ this walking every morning. It’s very invigorating. I’m noticing muscles forming and my body getting tighter. It’s not even hard anymore to wake up at 6:30 am or 7:30am to get dressed and hit the road, even with temps in the lower 40’s and 30’s. The walking is great cardiovascular and it also helps clear my mind to remind me of what I need to do that day. And Wednesday, I had a Dental Appointment to get my teeth cleaned. Afterwards, I decided to do a little grocery shopping to pick up some odds and ends to last me until Friday before we hit the road for D.C. I stopped into a couple of little boutiques and bought some things for the house… and headed home for a Green Salad and Minestrone Soup Lunch. I finally finished off the Salad I made earlier in the week (because Mike doesn’t eat the salads I make!) and ate a bowl of My Minestrone Soup with Whole Wheat Bread Slices. While I was eating, I had the chance to sit down and watch another Old movie on TMC Wednesday Afternoon. This one was a movie with Lucille Ball and Dezi Arnez. Right now, I can’t remember the name of it, but it also had James Mason in it. Cute movie.!!! 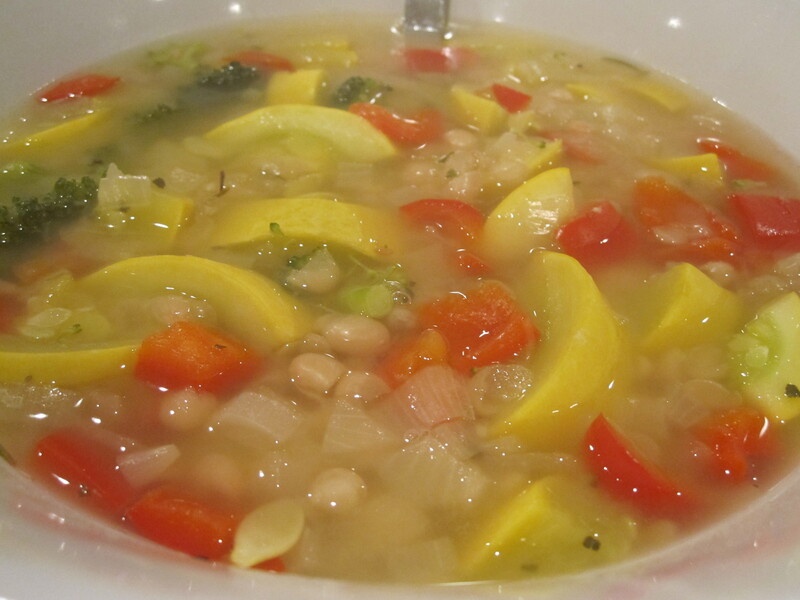 For dinner, I had the chance to make this White Bean Soup I had my eye on since the beginning of the week. I’ve wanted to make a soup with some beans in it, and the White Bean Soup sounded really good. 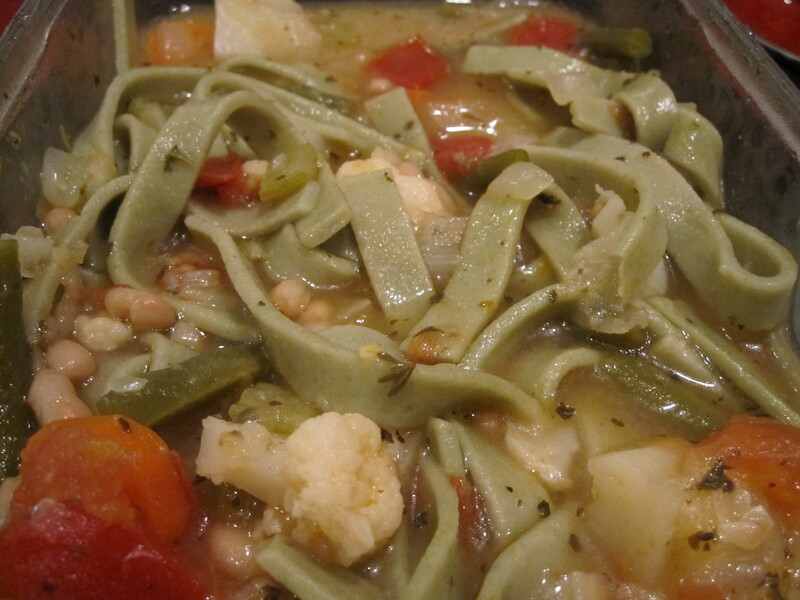 I ended up using the White Beans in the Minestrone Soup and again for the White Bean Soup. Another bonus for this recipe was, that I realized I had frozen some Vegetable Soup Stock and needed to use it. I warmed up the remaining slices of the Whole Wheat Bread and waited until Mike made his Cucumber, Tomato Salad with Lemon Dressing. 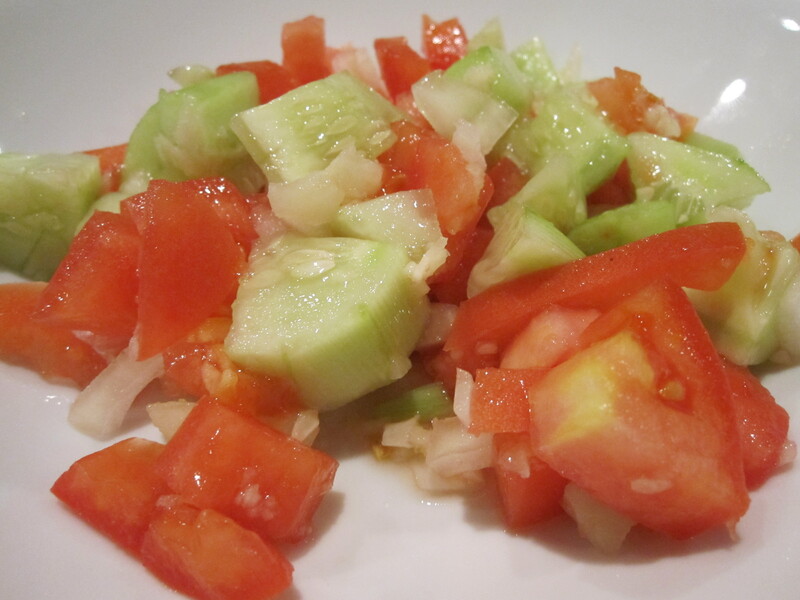 Wash, Peel and chop the Cucumbers and Tomatoes into a bowl. Cut half of a Lemon and squeeze onto the Salad. Mince Garlic Cloves and add Celtic Sea Salt to taste. Mix and Serve. Soak beans overnight and drain. Or drain beans from can, place in pot with soup stock and cook for 1 1/2hours if they are uncooked adding more soup stock or distilled water if needed. While beans are cooking, chop Onions, Broccoli, Squash, and Pepper. 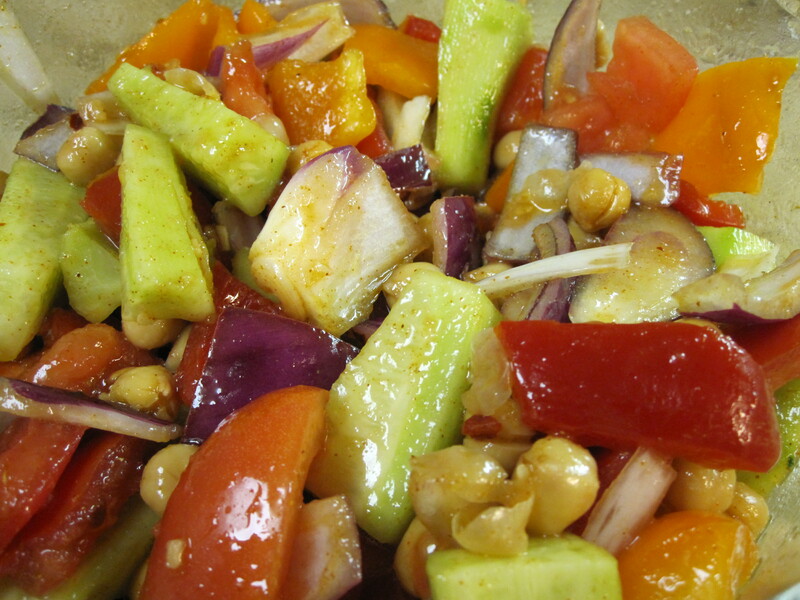 Add these vegetables, seasonings and Celtic Sea Salt to the beans and cook an additional hour. A Little Minestrone Soup Anyone? I was feeling a little inventive Tuesday afternoon. I took the day to watch old movies on TCM… it’s a hobby I don’t get to do very often. After having a late lunch of Green Salad with Oil&Vinegar Dressing, I decided to make a soup to use up some of the vegetables we had in the refrigerator. We’re going to be going back up to Washington D.C. area again this week. So I consulted with my cookbook “Recipes for Life” and decided to make a Minestrone Soup with some extra veggies (cauliflower). So I literally threw this soup together and warmed up a loaf of Whole Wheat Bread and we were ready to sit down for dinner. Rinse and soak White Beans according to the package instructions. Discard water and add fresh water. Cook according to package instructions, omitting salt and set aside. Cook pasta according to package instructions, omitting salt, drain and set aside. Heat Olive Oil in a large, heavy pan over medium-high heat. Add Onion, Garlic, Carrots and Celery. Sauté until Onion is translucent. Add Potatoes, Tomatoes, Zucchini, Green Beans, Cauliflower, and water. Reduce heat and simmer 30 minutes. Add White Beans and Pasta. Add more water if soup is too thick. In a blender process Basil, one whole clove of Garlic and 1Cup of Soup from the pot until smooth. Return this mixture to the soup. Mix well and serve hot. No End In Sight To BAD Eating! It seems as if I’m on a self-destructive path to destroy what I’ve been doing for the last 5 months. I obsess about foods I know I shouldn’t be eating, like Hershey’s Chocolate Bars, Cheese Pizzas, and Ice Cream. And every piece of food I look at, regardless of the nutritional value, I have this overwhelming desire to eat it! I know that I have a goal to lose weight and become a healthier person, but my alter ego steps in and just wants to eat everything in sight. The worst part, I don’t know why I’m being so ravenous about food now, whereas before, I couldn’t care less! I’ve been walking 30 to 45 minutes every morning for about a week… and doing piloxing too. Maybe I’m working my body and this urge is my body’s way of getting food. I think now I need to learn to eat better foods, and not the sugars and other BAD foods in front of me. I did pretty well for lunch today; I ate my Green Salad I made the other day with some Whole Wheat Bread. I had a late start to drinking my Carrot, Beet, Celery and Apple Juice and after I did so, I snacked on Organic Flax Maple Pecan Crunch. Then for dinner, Mike and I went to Carraba’s Italian Restaurant where I had a Mediterranean Salad with Oil and Vinegar and Riggotti Martino with Tomato Red Sauce. Plus I had a glass and a half of White Wine. Now I’m drinking my second Carrot, Celery, Beet and Apple Juice….